This is the big weekend in Hollywood, when the entire industry is focused on who brings home the gold trophy. The Oscars are the most prestigious awards in show business and reflect a collective vote from Hollywood insiders as to what movies, performances and contributions are the “best” of the year. Sideways: Picked up a lot of box office momentum since the awards season started, but still only about $60 million in theatrical. Sideways is the critics’ choice, some say it’s because they can identify with the intellectual and cultural pretentiousness of the main characters. Million Dollar Baby : Also gathering Oscar-driven steam, and now over $50 million at the box office. Clint Eastwood is becoming the sentimental favorite for this sleeper hit about a female boxer. Hillary Swank will probably win Best Actress. Finding Neverland: By all accounts a terrific movie that never really found its identity. It will hit $50 million, but barely. Apparently Johnny Depp has more crowd appeal as a slightly degenerate pirate. The Aviator: For all his critical acclaim, Martin Scorcese has never really had a big hit. This is his biggest financial success at $80 million and rising. (But will never offset the financial disaster of Gangs of New York!) But this biopic doesn’t have the story appeal to hit it big, despite the presence of Leonardo DiCaprio. Nevertheless, it is a favorite for Best Picture. Ray: Jamie Foxx and the music of Ray Charles really make this movie, but box office is stalled below $80 million. Foxx is a lock for Best Actor. I know this all sounds like a lot of money. But when real people vote with their wallets, what do they want to see? And the envelope please … Number three, The Passion of the Christ at $370 million; Number two, Spider-Man 2 at $373 million, and at the top of the list, Shrek 2, with a $436 million haul. I’m not suggesting these movies are better because they make more money. I think of them like books. I can appreciate great writing and love the classics. But I can’t resist a good spy novel. DVD Review: Shall We Dance? Many critics took great delight in panning this romantic comedy, which stars Richard Gere, Susan Sarandon, Jennifer Lopez and Stanley Tucci. And frankly, much of the criticism is probably well deserved. Shall We Dance is full of familiar jokes and time-worn clichés. The script takes convenient liberties. The acting is often over the top. And perhaps Gere is miscast, and Stanley Tucci as well. Yes, there are plenty of reasons to snub your nose at this effort. But despite these shortcomings, both my wife and I really enjoyed the movie. Why? It is an uplifting romance, light on its feet and often funny. And it has a few simple messages that we found warm and inspiring. Recently a friend who understands film theory better than I ever will told me that after years of study he had arrived at a simple formula: “I like movies that make me feel good.” Certainly there are other reasons people go to movies—maybe to be educated, provoked or excited. But there’s a lot to be said for feeling good. And that’s what my wife and I got from watching Shall We Dance —what we used to call "warm fuzzies." Another DVD released this week presents a sharp contrast. Ray , the academy-award nominated Ray Charles biopic, has received critical acclaim. It is beautifully shot. Jamie Foxx gives an extraordinary performance. And the Ray Charles music is incredible, especially if you have an affinity for jazz, blues and gospel. Yes, this is one fine piece of movie-making, and I was riveted through the entire show. But I can’t say that watching Ray made me feel good. Much of the drama centered around his years of heroin addiction and womanizing, which was incredibly hurtful for him and his family. I don’t doubt this is an accurate portrayal. It just pained me to experience it. Variety is one of the wonders of modern cinema. It's nice to have choices, and I'm glad that I was able to appreciate both of these movies. After six years of looking, I’ve yet to find any fat people in Park City. At first, this was simply an observation. Then it became something of a curiosity. But after several years of futility, you might say it borders on obsession. Now don’t get me wrong, I’ve got nothing against folks that are … oversized. Both of my parents fit (sometimes snugly) into that category. My interest in this subject is more anthropological than social snobbery. I grew up in Northern Minnesota and my progenitors were raised on milk straight from the cow and gravy with every meal. So even with long days of honest farm labor, pretty much every child-bearing woman and her husband had enough insulation to be comfortable on those cold January nights. But fat cells don’t need rural cultures to thrive. A short drive down to any mall in Salt Lake City reveals plenty of people of the corpulent persuasion. So why not Park City? 2. It’s the water. But we’re having a drought, so shouldn’t people be getting gradually heavier? Now some people might consider this unnatural thinness a desirable trait for a community. Unfortunately, it’s difficult to work into your advertising: Come visit Park City, where the air is thin and so are the people. 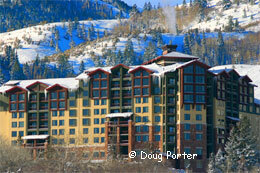 Or maybe: Park City—No crime. No traffic. No obesity. But in fact, this apparent selling point is a twin-edged butter knife. The fact that nobody’s fat means those folks that carry even a few extra pounds feel conspicuously out of shape. If you can’t pound moguls all day without resting, or take 10-mile trail runs while conversing normally, you feel like a heifer among gazelles. If there’s a little cellulite on a woman’s bum (even though she’s the only one that sees it, and then only while contorted in front of a mirror) she feels hopelessly like Oprah on a down cycle. The end result of this fitness phenomenon? General depression for 75% of our residents. But not to worry, I have a couple of ideas. One—offer incentives for overweight people to move into town. Maybe a tax break or something. Or better yet, food vouchers. Or, if Park City Thin has you feeling lousy about yourself, spend a week on a farm in Minnesota, where you’ll find people that look big, but care little about it. In other words, they don’t feel small about living large. How cool is that? I suppose that being thin is great, as long as everyone else isn’t thinner. I think the same goes for money, but that’s another blog.